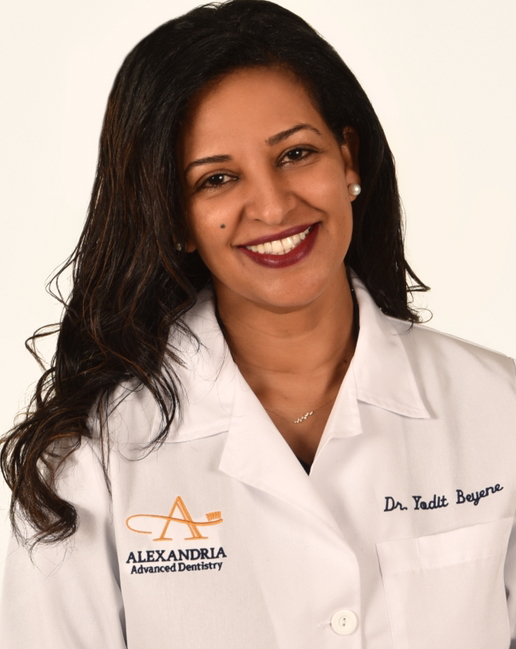 Alexandria Advanced Dentistry - Meet the Doctor - Yodit Beyene D.D.S., P.C. Dr. Yodit Beyene grew up in Alexandria, Va. and attended Mt. Vernon High School. After earning her B.S. from Georgetown University, she earned her Doctorate of Dental Surgery from Columbia University in New York City. She completed a General Practice Residency Program at Bronx-Lebanon Hospital. Dr. Beyene moved back home to Virginia and has been practicing dentistry in the DC area since 2004. Dr. Beyene is a caring, compassionate, and skilled clinician who is committed to high quality dentistry. Annually, Dr. Beyene continues to attend extensive seminars, workshops, and lectures to stay on top of the latest dental techniques and materials available in modern dentistry. This commitment to excellence allows her to utilize the newest proven techniques to maintain the best dental care for her patients. In her spare time she enjoys cooking, watching movies, traveling and spending time with family and friends. Dr. Yodit Beyene is an active member of the American Dental Association, Academy of General Dentistry, American Academy of Cosmetic Dentistry, The Spear Study Club, Virginia Dental Association, Northern Virginia Dental Society and the Alexandria Dental Society.